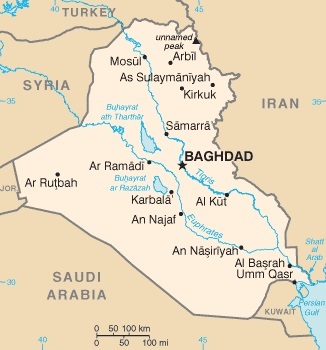 Iraq is Middle Eastern country, located in Southwest Asia. It borders Iran, Jordan, Kuwait, Saudi Arabia, Syria, and Turkey, and has a short coastline on the Persian Gulf. The country contains two major rivers, the Tigris, and the Euphrates. As of 2009, the country had a populaton of approximately 31.2 million, and additionally, a large number of Iraqis have been displaced to other countries, principally as a result of violence in the country. The capital and largest city of the country, Baghdad, has a population estimated to be around 7.5 million, and is located on the River Tigris, in the center of the country. Baghdad is the second largest city of the Arab world (after Cairo, in Egypt), and dates back to the 8th century. Recent Iraqi history has been dominated by a series of wars. The Iran-Iraq war of 1980 to 1988, the Iraqi invasion of Kuwait in 1990, followed by the Gulf War ("Desert Storm") of 1991, and most recently the US-led invasion of the country ("Operation Iraqi Freedom") in 2003, followed by several years of continued violence in the aftermath of the invasion. It is however begun to look as though things may now be beginning to improve, and violence levels seemed to have been falling from late 2009. The Iraqi economy is dominated by oil, and this sector accounts for about 95% of foreign exchange earnings. At present, the economy is still recovering in the aftermath of the recent wars and the economic sanctions which were imposed on the country for several years after the 1990 Iraqi invasion of Kuwait. This brand new edition of Bradt's unique guide to Iraq gives up-to-datetravel information and also informs the armchair traveler aboutthe history and exciting archaeological prospects of this ancient land with arich culture. Ancient sites such as Babylon and Ur, the stunning architectureof the country's mosques, the natural beauty and wildlife of the Marshes andbeautiful Iraqi handicrafts create a myriad of attractions to inspire even themost seasoned traveller. The authors, Geoff Hann, KarenDabrowska and Tina Townsend-Greaves, bring their considerable knowledge andunderstanding of Iraq to provide all the practical and background informationneeded to explore this country and to get the most out of your trip.Advice on cultural awareness and religious sensitivity in thecontext of Iraqi history, alongwith where to get the latest information on which parts of the country youcan still visit, make this an invaluable guide. Iraq today is synonymous in the minds of travelers with the past. Barely two hours from Baghdad, one can walk in the footsteps of Nebuchadnezzar in Babylon or drive past Nineveh's pre-history ochre walls, with their caverns and winged lions. Whether you live, study or simply travel abroad, our Iraq Vacation Journal is the most exciting and eye-catching way to keep all your travel plans and memories in one place! With razor-sharp wit and insight, intrepid journalist Tony Horwitz gets beyond solemn newspaper headlines and romantic myths of Arabia to offer startling close-ups of a volatile region few Westerners understand. His quest for hot stories takes him from the tribal wilds of Yemen to the shell-pocked shores of Lebanon; from the malarial sands of the Sudan to the eerie souks of Saddam Hussein’s Iraq, a land so secretive that even street maps and weather reports are banned. As an oasis in the Empty Quarter, a veiled woman offers tea and a mysterious declaration of love. In Cairo, “politeness police” patrol seedy nightclubs to ensure that belly dancers don’t show any belly. And at the Ayatollah’s funeral in Tehran a mourner chants, “Death to America,” then confesses to the author his secret dream—to visit Disneyland. Careening through thirteen Muslim countries and Israel, Horwitz travels light, packing a keen eye, a wicked sense of humor, and chutzpah in almost suicidal measure. This wild and comic tale of Middle East misadventure reveals a fascinating world in which the ancient and the modern collide. This new Bradt title responds to huge public interest in both Iraq and its people and is less a travel guide  certainly for the time being  and more of an objective account of Saddam’s regime as a whole, and the build-up to the recent conflict. Focusing on developments in post-Saddam Iraq, without ignoring the horrors which have occurred in the aftermath of the war, the author highlights the country’s positive progression, with chapters such as Iraqi Voices’  describing the hopes, fears and ambitions of Iraqis  and Post-Saddam Iraq’  where we get to hear the views of prominent politicians on the war and how it was handled. When Bradt published the first edition of its travel guide to Iraq, the country was slowly breaking free from the shackles of sanctions, Western tourists were returning in small numbers and it looked as if the fledgling tourist industry would grow. As in that travel guide, this new book introduces the magnificent ancient Iraqi civilisations and provides a historical background to the country, as well as providing updated practical information on which places are still open to visitors.